Servlet and JSP are the main technologies to develop the web applications. Servlet was considered superior to CGI. Servlet technology doesn't create process, rather it creates thread to handle request. The advantage of creating thread over process is that it doesn't allocate separate memory area. Thus many subsequent requests can be easily handled by servlet. Problem in Servlet technology Servlet needs to recompile if any designing code is modified. It doesn't provide separation of concern. Presentation and Business logic are mixed up. JSP overcomes almost all the problems of Servlet. It provides better separation of concern, now presentation and business logic can be easily separated. You don't need to redeploy the application if JSP page is modified. JSP provides support to develop web application using JavaBean, custom tags and JSTL so that we can put the business logic separate from our JSP that will be easier to test and debug. As you can see in the above figure, there is picture which show the flow of the model1 architecture. Navigation control is decentralized since every page contains the logic to determine the next page. If JSP page name is changed that is referred by other pages, we need to change it in all the pages that leads to the maintenance problem. Time consuming You need to spend more time to develop custom tags in JSP. So that we don't need to use scriptlet tag. Hard to extend It is better for small applications but not for large applications. Model 2 is based on the MVC (Model View Controller) design pattern. 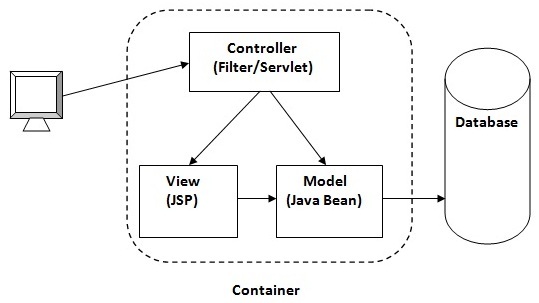 The MVC design pattern consists of three modules model, view and controller. Navigation control is centralized Now only controller contains the logic to determine the next page. We need to write the controller code self. If we change the controller code, we need to recompile the class and redeploy the application. Visit here to get the Example of MVC using Servlet and JSP. It uses the declarative approach for defining view components, request mapping etc. It resolves the problem of Model 2 architecture. The Struts framework provides the configurable MVC support. In struts 2, we define all the action classes and view components in struts.xml file.